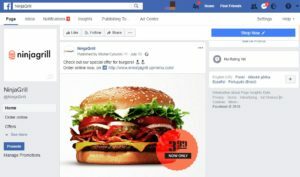 In the recent article entitled How to manage a restaurant Facebook page? 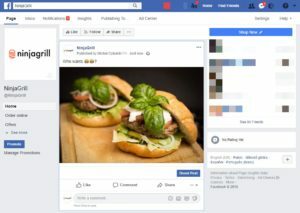 Part 1 we discussed 7 rules for managing a restaurant Facebook page. In the second part, we will present 7 further steps that will help improve your restaurant online marketing. Facebook provides the possibility of promoting posts. A “Promote post” option appears under each published post and, despite the fact that this seems to be the easiest action, you should not activate an advertisement this way. They can be targting at the wrong recipients. Each sponsored post should be created from the level of advertisement manager. 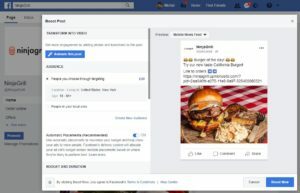 Facebook provides significantly more advanced settings to companies and, as promoting content on social media is currently the basic rule of restaurant online marketing, it is worth using them. Videos are an effective method for making a restaurant Facebook page more attractive. Currently, Facebook focuses more on promoting video content and it can have a greater reach than photos. When you add a video directly onto the restaurant’s Facebook page, it will be played automatically to your customers. 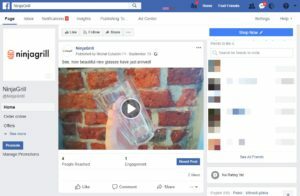 Initially, this option was only available for private accounts but today, Facebook plays videos automatically when shared by company profiles if a given person likes such a page. This is a great restaurant online marketing tip – thanks to automatic playback of videos, it is much easier to catch the attention of customers. Nevertheless, video content may often receive fewer reactions; when watching a video, recipients frequently forget about adding a comment or liking the post. What can appear in the videos? See how your staff prepare the restaurant floor for accepting customers, or how the chef is working in the kitchen. Add a funny comment from behind the camera and you will have prepared an ideal post that shows your restaurant’s operation honestly. Keep in mind that video quality should be satisfactory and video content should be interesting – short, entertaining or funny. 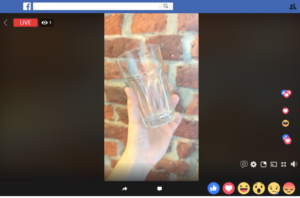 Since the launch of Facebook live, live transmission has been strongly promoted. When you start your live video, each of your followers will be notifing, no content published on your restaurant page will fail to receive such support. However, in order from your live video to produce effective restaurant online marketing, it has to feature content that provides something to the recipients. Artistic events, special occasions, contests or celebrity visits broadcast live are a great idea. If something interesting happens at your restaurant, be sure to share it on social media. It is worth remembering about good quality equipment and high-speed internet. Otherwise, you may face criticism and only few recipients of your live feed. Promoting further events of this type on social media may then turn out to be significantly more difficult. 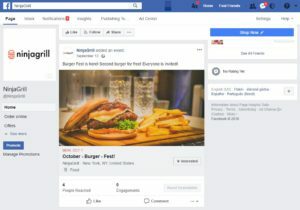 Promoting the restaurant through Facebook events is one of the best ideas for online restaurant marketing, as this way you can build a community around your restaurant. Similarly to Facebook live, each post added to the event page generates notifications, however; they are only sent to the event participants, not to all followers of your page. Facebook events should, therefore, be published at least one week prior to the event that you plan to organise at your restaurant. Emojis are a universal language of the 21st century. Used in restaurant online marketing they often replace words or even entire phrases. They attract attention and generate positive emotions in their recipients. Through emojis, Facebook provides the possibility of letting other users know how you feel, what you are eating, what you are celebrating, etc. To see the list of the available options, all you have to do is click the smiley symbol next to the post window. You will see an entire list of possibilities to choose from! When you offer UpMenu online orders, you can easily set any discount or promotion. Sometimes, customers need a little encouragement to place an order via the Internet. This is why you should include promotions in the restaurant marketing strategy. It is well worth preparing an interesting offer for them: a discount for the first order, a permanent promotion, or a special discount code that will make it possible for your customers to place orders with a discount. Organising contests is another great opportunity for activating your existing customers and gaining new ones. Inviting others to join the fun, especially where they can win a prize is one of the best practices in online restaurant marketing! Well-organised contests that are compliant with the Facebook terms and conditions will always attract attention and generate traffic to your page. Keep in mind that when creating a contest, you have to include the terms and conditions and provide them to your recipients. Facebook has clear guidelines on how to manage such campaigns properly. Photo contest – ask your followers to take a photo of a meal from your menu. A person interested in the contest must visit the restaurant, order any meal, and take a photo of it. You can suggest that the photos are included in the comment section of the contest post. The winning photo will be the one with the biggest number of votes, or one that was picked by a jury appointed beforehand and composed of your employees. Contest for a meal name or recipe – suggest your fans come up with a name or post a recipe in the comment section for a dish they would like to have at your restaurant. Submission with the largest number of posts will win. The above are only a few ideas that you can use in online restaurant marketing. Keep in mind that tagging, sharing or drawing a winner should not be the conditions for choosing winners. Vouchers, free dinner for two or discounts, etc. you can offer as the contest prizes. 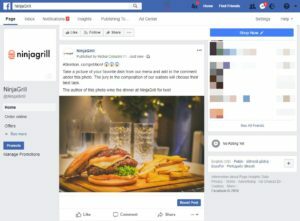 When publishing posts on your restaurant Facebook page it is worth considering the above as well as the remaining 8 tips listed in the article entitled 8 of the best ideas for posts for your restaurant’s Facebook page. Use the full potential of social media in restaurant marketing! Combine online activities with offline activities. Along with UpMenu, you will build a trustworthy brand, bypass the competition, and become closer to your customers. We hope that you found this article helpful. If you have any questions, feel free to contact us.